The next part of our Titanic Photographic Series will look underneath the Titanic's stern fantail and specifically explore the port propeller. With the collapsing of the fantail area, getting to observe the port propeller is a very tricky and dangerous maneuver for the MIR submersible. Our submersible pilot, Genya Cherniev, is an expert pilot and we were able to get up close to the propeller without any difficulties.The first two pictures takes us directly under the stern fantail and where the rudder once was placed. The middle picture is a panoramic view of the port propeller with two of its three blades exposed. The final two photographs are close-up shots of the propeller that show the prop shaft and a blade of this propeller. Please note in the extreme close-up that the bronze of the blade is very pristine and our submersible lights are reflecting off this blade to show off a golden hue. Another noteworthy observation is that the original red paint and nuts are clearly visible. To access these new photographs, as well as other Titanic photographs, scientific research paper and accompanying PowerPoint presentation go to our corporate website at http://www.nauticalresearch.com and within the text of this home page select the link entitled Educational Services. This will bring you to our educational page where all this valuable information can be viewed and downloaded for personal use only. I will be placing new photographs from various sections of RMS Titanic every week so you might like to syndicate our site to be notified of the latest news. Next week, we will be publishing the latest photographs from the stern section that will highlight the huge Titanic engines. The size of these engines are truly unbelievable! Nautical researcher David Bright, whose efforts to find an infamous missing plane in the Bermuda Triangle are chronicled in the upcoming SCI FI Channel investigative news special The Bermuda Triangle: Startling New Secrets, told SCI FI Wire that he did not go into the project with any preconceived notions about what he would or would not find. "Absolutely not," Bright said in an interview. "I think the beauty of what we were doing is because we all had varying backgrounds on the project. They all came into play. What we did is before we even went out we did a bit of what we call 'What if?' scenarios. So in order to get to that point, what we really needed to do was to essentially do an awful lot of research." 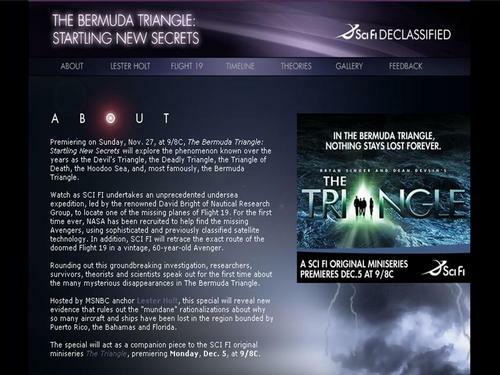 The special documents Bright's expedition—which included a team of more than 20 scientists and technological experts—as they searched for the truth behind the Bermuda Triangle's most famous incidents. In 1945, a squadron of bombers called Flight 19 was lost during a training mission off the coast of Florida. The rescue plane sent to find them a few hours later also disappeared. None of the planes has ever been found. To see the remainder of this full-length story, please select this Sci Fi Wire website link. There is a unusual fascination about the Bermuda Triangle that has been quite a curiosity to me. I spend a large amount of my time in the Triangle area and must admit that strange happenings within this area are usually chalked up as a brief anomaly without much fanfare. In putting together the underwater expedition, I have found the media to be equally fascinated by the Triangle phenomena. We had to keep the project under strict confidentiality for fear that we would be inundated by interested spectators while doing our discovery/exploration activities out in the ocean. One elderly gentlemen saw us unloading the side scan sonar at the dock and he thought that we had found a torpedo from a missing enemy submarine (actually the design is quite similar). Following our project, all 20 of our expedition members were sworn to secrecy about our project and I commend them for their discipline over the past few months in not divulging our exciting project. I have been giving interviews all month to various newspapers, magazines, internet, radio and television crews with various major networks. It is amazing how many different ways that the same question regarding our outcome was phrased. Fortunately, I am an old pro at this type of questioning and was able to deflect them to watch the show. The SciFi Channel is promoting this documentary as part of their efforts to promote their Triangle mini-series that premieres on December 5th. The following picture is taken from the SciFi Channel's internet home page and shows a picture of me (right) and NBC News anchor Lester Holt discussing the project while motoring out to our survey site. Welcome to those special invitees to this Shipwreck web log. We are the leading source for shipwreck information using the latest in high-tech underwater discovery and exploration research and technology. Although technically an aircraft is not a shipwreck, the techniques used to find an aircraft are very similar to finding a shipwreck. Unfortunately, an aircraft is much smaller and presents a unique challenge. Enclosed is the formal announcement from NBC News/SciFi Channel of our latest big-budget documentary looking for the lost Mariner rescue aircraft that was sent out over the Bermuda Triangle to find the legendary lost 5 Avenger aircraft. Starting next week, we will be giving you very specific information about our underwater expedition. In the meantime, enjoy the documentary that premieres on Sunday, November 27th and I wish you a safe and wonderful holiday season! To make this picture larger, double-click with the pointer on the picture. Following my brief five minute presentation at the United States Capitol about the loss of six US Navy aircraft sixty years ago on Thursday, I have decided to place seven photographs of the stern section of RMS Titanic on the corporate website. I would like to give a special welcome to the Titanic Modeling group who are looking over these photos to assist them in creating a model of the wreck site. To augment their study, we have announced the release of detailed video of our Titanic expedition that will be released on our corporate website starting in January 2006. This will help to put the photographs in perspective to various locations on the shipwreck. Additionally, Nautical Research Group will be releasing a comprehensive virtual dive DVD using our high-definition video in April 2006. The following part will show various locations on the stern section of Titanic. As Titanic descended through the depths, the stern decks imploded due to the escaping air that was not able to equalize at these extreme pressures. The result is that the stern of Titanic looks like it went through a food processor. The two photographs show the extreme aft section of the stern and its associated rusticle formation. The next two photographs will explore the top of the poop deck area and the remains of one of the stern cranes. The single photograph is adjacent to the crane and shows how fragmented and indistinguishable the stern area of the Titanic has become since her sinking. The last two photographs show the port side stern railing just above the propeller and its adjacent starboard side rail that illustrates its collapsing decks. To access these new photographs, as well as other Titanic photographs, scientific research paper and accompanying PowerPoint presentation go to our corporate website at http://www.nauticalresearch.com and within the text of this home page select the link entitled Educational Services. This will bring you to our educational page where all this valuable information can be viewed and downloaded for personal use only. I will be placing new photographs from various sections of RMS Titanic every week so you might like to syndicate our site to be notified of the latest news. Next week, we will be publishing the latest photographs from under the stern section of the ship and port side propeller. You be be amazed at the preservation of the propeller! Although we are in the midst of our Titanic Photographic Series, I would like to tell you about another very exciting wreck project that we led this summer. We had many diverse diving expeditions and projects in 2005 (see Updated News section of our corporate web site) but the most unique expedition of the year was the huge diving operation that we had in collaboration with the Naval Historical Center and NBC News. There will be more web log articles about this project later this month but I don't want to give away any of our discoveries just yet. As a sneak preview, visit this website that was recently created by the NBC News/Sci Fi Channel announcing the exciting documentary that will air on November 27th. As part of the recognition of the 27 lost airmen, a resolution was introduced in Congress that would memorialize these brave Navy aviators. This congressional resolution has received formal approval and will be officially unveiled as part of a ceremony on Capitol Hill on Thursday November 17th. A global news conference has been scheduled up on the Hill to introduce this new exciting documentary and I will be one of the guests of honor with Florida Congressman Clay Shaw; NBC News Anchor Lester Holt; Bonnie Hammer, president of USA Networks and the Sci Fi Channel; and Dave Howe, Executive Vice President and GM of the Sci Fi Channel. This scientific research expedition was undertaken like no other previous expedition before to discover and explore the mysteries behind the disappearance of these Naval aircraft. This SPECIAL two-hour documentary will premiere on the Sci Fi Channel on November 27th at 9 pm EST/8 pm Central. Check your local listings for this show outside of the United States and out West. As previously announced, due to the great success of our Titanic Photographic Series, we will be adding two more parts to the series for an overall total of ten. Additionally, we have announced that we will be including selected video clips of Titanic starting in January. Once again, thank you very much for making this site the number one blog for shipwreck research and information. The following part will feature the boiler room area at the aft end of the bow section of RMS Titanic. There were a total of twenty-nine boilers on Titanic. Of these twenty-nine, twenty-four were double-ended and five were single-ended boilers. Each of the double-ended boiler is 15 feet nine inches diameter and twenty feet long and contained six furnaces. The single-ended boiler had the same dimensions but were 11 feet nine inches long with three furnaces. Overall Titanic had 159 total furnaces and from the porthole of the submersible, appear quite massive. Our final picture of this part shows how the aft section of the bow is starting to settle and materials from above are sliding down towards the boilers. To access these new photographs, as well as other Titanic photographs, scientific research paper and accompanying PowerPoint presentation go to our corporate website at http://www.nauticalresearch.com and within the text of this home page select the link entitled Educational Services. This will bring you to our educational page where all this valuable information can be viewed and downloaded for personal use only. I will be placing new photographs from various sections of RMS Titanic every week so you might like to syndicate our site to be notified of the latest news. Next week, we will be publishing the latest photographs from the stern section of the ship. Today's web log article is submitted by Rob Goldsmith, the UK History Channel Titanic diver and my submersible dive partner on this year's Titanic expedition. Rob's article will formally announce support for this link on our site to his wonderful web site that has many Titanic pictures from our expedition - including some pictures of me. I hope that you enjoy his site! Rob Goldsmith's Titanic web site is no ordinary Titanic enthusiasts website, it tells the story of my personal journey from my interest in the Titanic from the age of eight through to my dive to the wreck site in July 2005 which I was lucky enough to win in a competition run by The History Channel. The website contains a day to day weblog as well as a comprehensive photo gallery. The photo gallery shows a large collection of shots including the wreck, submersibles, Keldysh and general life on board ship. Explore the site further to see photo galleries from Biggin Hill Airshow and the Goodwood Revival, probably the most famous classic car event in the world. Finally get to know me better by looking at pages showing my work as a freelance cameraman and my interest in the Mini and sign up to my free discussion forum. Rob's History Channel documentary aired in the UK last month to overwhelming success. There are plans to distribute this show to other areas of the world and we will announce this on our blog. In order to visit his site, we have placed his link on the right hand column of this web log. I know that you will enjoy all the pictures! I was planning on showing the structural starboard side hull damage on the bow and the boilers for this part of our series; however, the structural damage to the starboard bow is too great and will be the most important concern to the overall integrity of RMS Titanic. Therefore, I will devote this entire part of my Titanic photographic series to this alarming damage as it will be an area of continued future study to evaluate the on-going condition of Titanic. Part Six contains a great view of the structural damage that is naturally occurring on the starboard hull just below and forward of the bow cargo crane. The picture in the upper left shows Mir I exploring the front superstructure below the telemotor. From this angle, you can see how the mast has collapsed at such a sharp angle. The remainder of these pictures are quite dramatic when you realize that at least four deck levels are opened to the ocean on the starboard hull. As the ship is starting to collapse on the inside, the structural integrity of this area is being compromised and further deterioration is proceeding along the starboard hull. Observe the cracks and separation of the hull plates that will only get worse over time that threaten the overall integrity of the entire bow of Titanic. To access these new photographs, as well as other Titanic photographs, scientific research paper and accompanying PowerPoint presentation go to our corporate website at http://www.nauticalresearch.com and within the text of this home page select the link entitled Educational Services. This will bring you to our educational page where all this valuable information can be viewed and downloaded for personal use only. I will be placing new photographs from various sections of RMS Titanic every week so you might like to syndicate our site to be notified of the latest news. Next week, we will be publishing the latest photographs from the boiler room at the aft bow section of the ship.